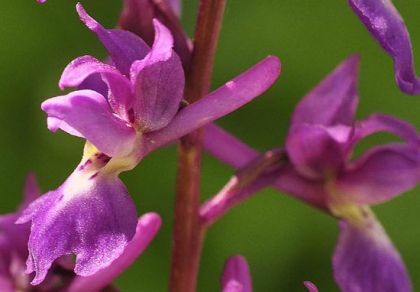 In tall spikes (up to 40cm), on neutral or calcareous soil, this stunning orchid can be found from April to June. The colour of the flowers can vary from deep purple, through pink to white and the flowers can be distributed in dense or quite loose spikes. Each flower (8-12mm long) has a lower lip or labellum which is shallowly lobed with dark purple spots running down the pale upper part of the central, notched lobe. Above this petal is a sepal which forms a hood and there are two more sepals standing erect like little rabbit's ears. One feature which distinguishes this orchid is its long, stout, upturned cylindrical spur. The lower leaves first appear in January as a rosette of four to eight oblong, blunt-tipped leaves and can be plain, spotted or heavily blotched. The flower stem arises in spring and along it are small leaf sheaths. A second distinguishing feature is the distinct smell of tom-cat's pee! 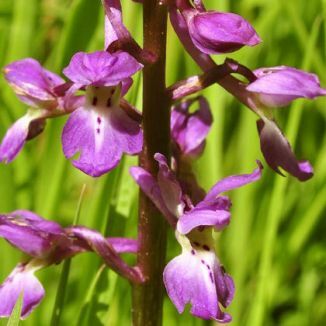 Early-purple Orchid grows well in broadleaved woodland, on road verges and on limestone pavement. This perennial is a native plant and it belongs to the Orchidaceae family. I first identified this wildflower in 1981 on Moneen in the Burren, Co Clare and I photographed it in Co Wexford in 2009. My thanks go to Jimmy Goodwin of the Wexford Naturalists' Field Club for helping me to find this flower again. But our cull-cold maids do dead-men's fingers call them'. It is claimed that when William Shakespeare wrote those lines in Hamlet, his 'long purples' referred to the Early-purple Orchid. The lines were spoken by Gertrude and referred to the coronet which Ophelia was wearing when she drowned.